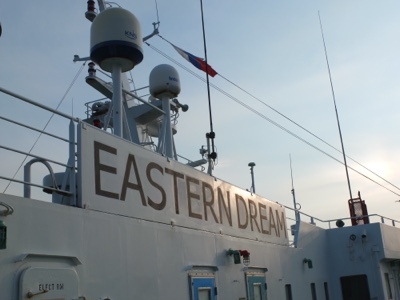 The Eastern Dream is a Japanese built ship run by a South Korean company. It’s a small ship carrying mixed freight and passengers, I would guess 200 or so of us. That is probably 150 Koreans, 49 Russians and one Englishman. It’s not an uncomfortable boat to be a passenger on, but the accommodation is rather spartan and hugely expensive. 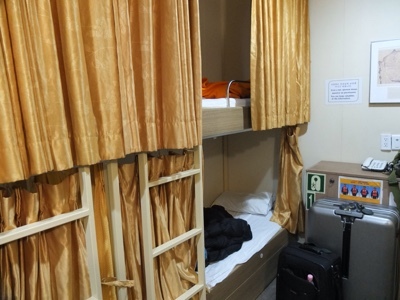 My bunk is in a room shared with seven other Russians (they seem to segregate nationalities) at a cost of $350 USD. Most people are in dormitory rooms of 30 or so, some in bunks, some sleeping on mats on the floor. If you want an en suite cabin it’s $800 USD. Madness! 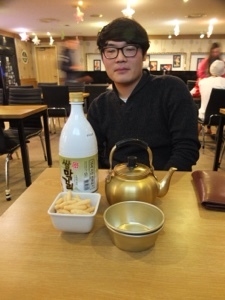 I’m lucky to have Taegeun to talk me through the Korean buffet dinner. It is very popular with the Koreans on board, but the Russians are all absent from what feels like a supper club. After dinner I’m treated to an introduction to Makguli. It’s a Korean rice wine, and it takes a couple of bottles for me to perfect the mixing and dispense. Taegeun is clearly a master and I am his Padawan learner in the science of this. 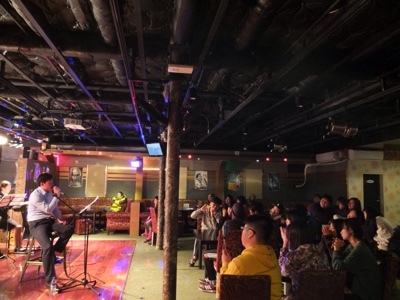 To complete my Korean 1.01 cultural crash course, it’s an after dinner Korean sing along in the disco. Sleep does not come easily to me once again, this time as I feel the hot and cramped conditions of the room to be pretty claustrophobic. I drift off in the early hours to be woken by a tannoy announcement at 7.00am in three languages, but not my own. I then remember why my sleep has been poor – the Russians have been holding a full on party in a stairway near my room all night with some game Koreans. The Russian Far East really is a melting pot of nationalities that seem to tolerate and get on with each other. It feels like a “wild frontier” to me – where Moguls meet Russians, where Koreans mix with Chinese, and where the boundaries of ethnicity and language are at times blurred. North Korea is now to be seen off the starboard bow and there is reasonable sea swell. We are pitching and rolling in the waves as much as to make me feel on the edge of being unwell. As if by magic Taegeun appears outside my room and says we have been delayed due to Russian ship movements in Donghae harbour. 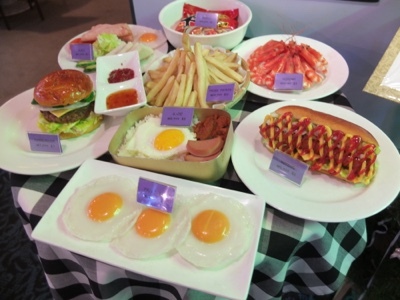 Time for breakfast.. Kill or cure. 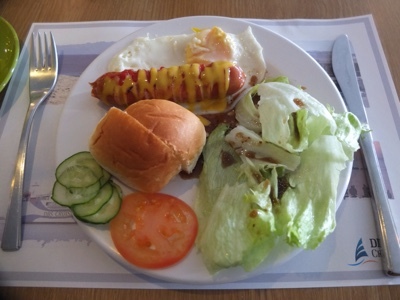 It is supposedly Western, but the advertised choice (with a life like plastic model above) has many substitutions – my toast for a bread roll, my bacon for a hotdog, but I am blessed with some complimentary lettuce dressed in a Korean version of soy sauce. On deck it’s a windy but warm day. The temperature was cold overnight but is now well above freezing. The hills of South Korea are getting closer out of the window of the cafe. I’m can’t put my finger on why, but I’m feeling great. It’s partly about the sunshine and warmer climate here, but also good to be arriving in a new country for the first time.